"Art Journalling with Tim?" I hear you cry... "But Tim Holtz doesn't do much art journalling". You're right, he doesn't (or if he does, he keeps it to himself! ), so what I'm looking for is how you incorporate Tim's techniques, style and products into your own art journalling. Remember that we are always a Tim Holtz inspired challenge so we do want to see that your project is inspired by one of of his wonderful techniques that he so freely shares, and/or by his style, and/or by the amazing array of products he has created for us all to play with. We love visiting to see your work, and it's really helpful to us when you mention in your post exactly what it is in your project that is Tim-inspired. So for this month it's Tim-inspired art journalling, please - any size, any format - as long as it clearly follows our Travelling Instructions. Our challenge is a monthly one and a randomly chosen winner will receive a £20 gift voucher from our very generous sponsor, Country View Crafts. We also award our Pinworthy badges to the Top 3, chosen by the Creative Guides. And now without further ado it is time to unveil the art journalling pages created by our Creative Guides to inspire you. For my journalling I've turned to the things I fell in love with when I first encountered Tim Holtz and his work - stamping and Distress Inks (including the new Wilted Violet and Ground Espresso), and a favourite Tim technique, wrinkle-free distress. I'm in a strange transitional mood at the moment - enjoying the gentle melancholy of autumn, but also with many new adventures being lined up for the future. I think all of that arrived in my pages. If you'd like to see more, do come and visit Words and Pictures. 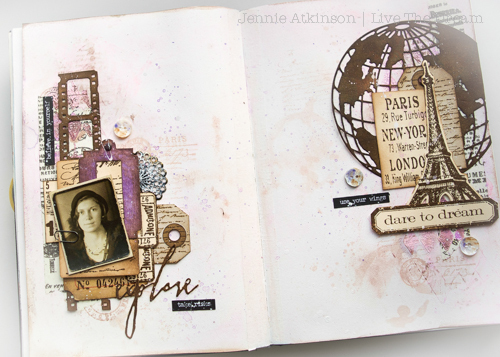 I love journalling so when Alison chose this theme for our latest challenge I was delighted. 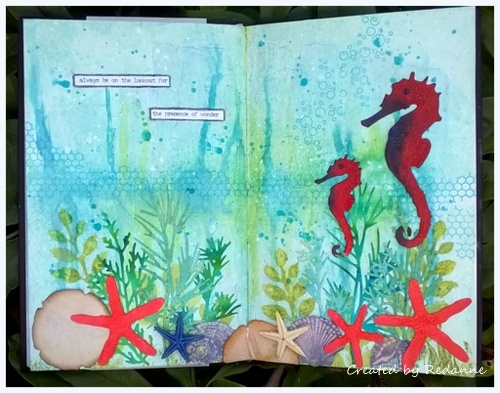 I did feel a little challenged too though, because art journalling with Tim? Not something the great man himself does very often..... So though I have certainly used plenty of his products, I'm not sure that this is totally journalling Tim style. If you want to find out for yourself, just click HERE. 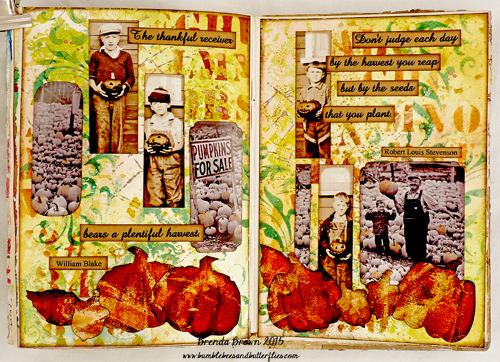 I am still fairly new to Art Journalling but I had great fun with Alison's fabulous challenge using many of my favourite Tim products, dies and stamps. My new Wilted Violet Distress Spray Stain and Distress Ink Pad had literally just been delivered by the postman so I just dived in with this fabulous new colour and paired it with Ground Espresso. I absolutely loved the varying degrees of mauves and pinks I managed to achieve. 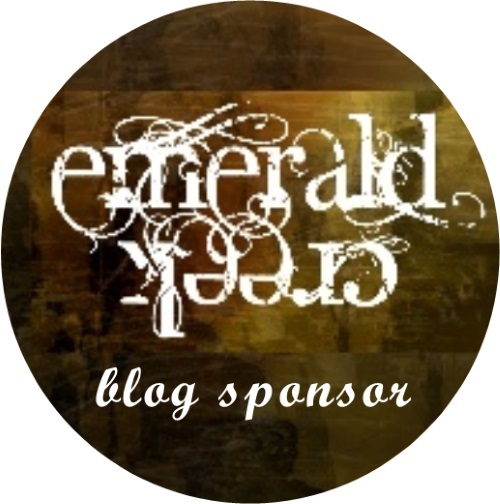 Please hop on over to my blog if you would like to see some more details. Alison's wonderful challenge this month is just perfect for me, I have put an end to my journaling procrastination. I had so much fun with this page and enjoyed all the steps along the way. I packed it full of Tim's products and techniques. I hope you will drop by my blog to see how I did it. I joined in with Alison's challenge this month because I needed the push to make myself play. I have not been happy with the few attempts I've made in the past to journal and so I really tried to focus on what looks pleasing to me when I see someone elses pages. I'm finding "Less is More" and some sort of symmetry work for me! Here I have embossed, sponged, stenciled and added Idea-ology pieces. Thank you, Alison, for challenging me to try journaling again! You are certainly one of the masters at it! You'll find more details on my blog post here. It was with some trepidation that I joined in Alison's wonderful challenge as I am very new to journalling but it was the push I needed. 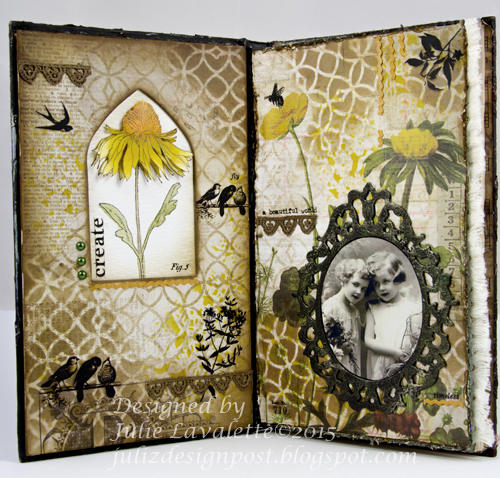 Staying within my comfort zone I used my all time favourite dies by Tim along with techniques from his July 2014 tag to create my page. There are more details over on my blog. 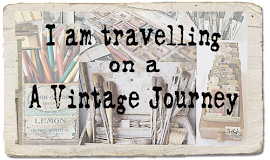 I have only ever made one Journalling page prior to this Challenge that Alison gave us, so I was keen to join in to have another go, although I feel rather apprehensive as this is truly out of my comfort zone. Tim's Botanical paper pad and his flower stamps have inspired me to up-cycle a book into an Edwardian Style Ladies Journal. 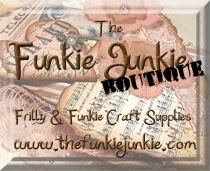 Over at my blog Juliz Design Post you will also see my next set of pages in it and how I decorated my cover. When deciding what to do for my journal pages autumn, harvest and halloween all came to mind, so not sure on where I would go I wrote myself a list of layering techniques for making the background. Having chosen my starting colours I was off and as ideas came to mind I gathered together the found relatives and dies that I could use. There's lots of Tim in these pages, I even finished with some photo tinting. 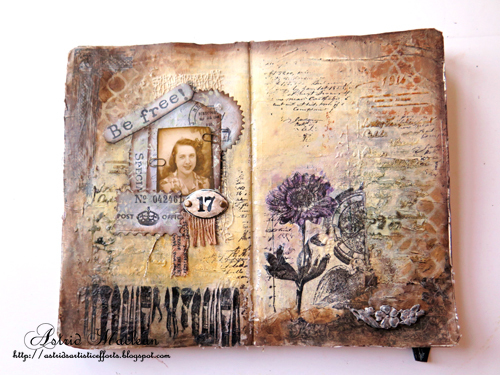 What an amazing array of journalling inspiration! And I'm so grateful that some of the Creative Guides have dared to jump outside their comfort zones for this theme... I think the results are fantastic. I hope you'll be inspired to do the same. If you think journalling is not your thing, maybe you'll find you're wrong! Do come and try some Art Journalling with Tim - you have a whole month to play, so why not explore some new paths? As always there's a randomly drawn prize voucher from our generous sponsors Country View Crafts on offer, as well as our three Pinworthy spots chosen by the Creative Guides. If you would like more information and details please email Brenda at brenda_brown25@hotmail.com by Monday 5th October. A huge thank you to all of you for creating these amazing inspirational pages. I know it was a leap outside the comfort zone for some, but I think the results speak for themselves - fantastic work all round! Alison! I really don't believe you have a comfort zone- stunning pages!! What a great effort from the team on this challenge. For those of us who stepped out of our comfort zone, congratulations! Really wow! You all made beautiful art journaling pages with beautiful colours and backgrounds! Great new challenge, Alison! Fabulous journalling from the guides! Outstanding work teamies!! So much inspiration and so many different takes on this theme! 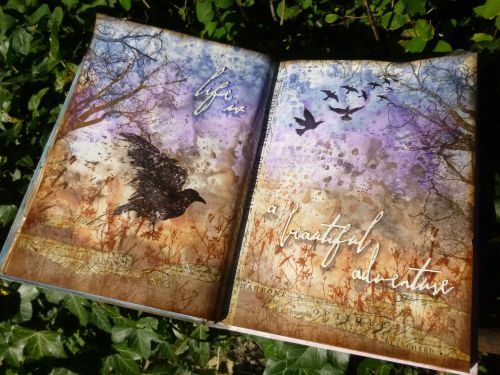 It just shows the versatility of journalling.... A great theme Alison, and well done to all of you for whom this meant stepping out of your comfort zone! truly inspiring pages everyone! Hope to join in this month! 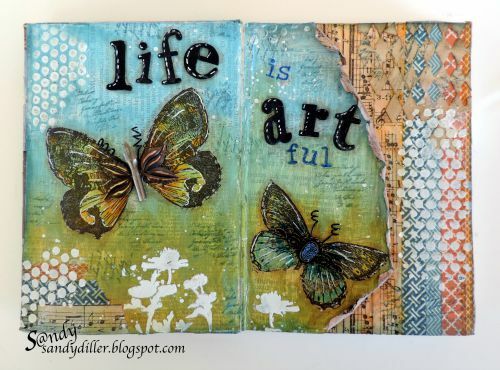 Thanks for this fabulous theme Alison..yes art journaling is one of favourite. I hope I'll be able to join in this challenge soon. DT girls you have made fantastic inspirational pages.... I just can't take my eyes off....I'll be visiting all to see your lovely work in close up view. Thanks for your fabulous inspiration, ladies! Art journaling is so wide, let's find some place to meet Tim here! So beautiful! I love vintage and I love your header, too. Fantastic challenge theme, really inspired and impressed, a great collection of stunning projects!! 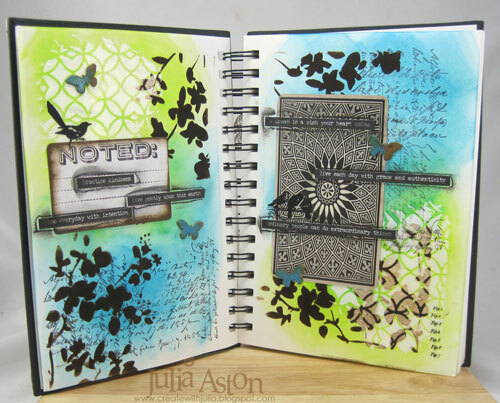 Now this is one gorgeous collection of Art Journalling Tim style! Each one is so unique and inspirational. Love them all! Fabulous challenge and of course everyone's art is wonderful! Thanks so much for all the creative inspiration and for the fun challenge! This is a lovely theme .. Each and every DT projects were so lovely , couldn't take my eyes of them .. Just wowing every work..